Christmas really loaded me up with beers. Firstly, I bought loads of good stuff in for the season, which I didn’t actually finish all of, and then loads of lovely friends and family bought me plenty of booze too. Hoorah! Here, we find a post covering three German beers which came in a box of assorted British ales and German beers of all types. Unfortunately much of the British stuff was drunk with a friend one evening, and, as I’ve said, I don’t like many notes when I’m socialising. It’s rude, and I like catchy up with my chums. So they may never get the Reet Good treatment. Pity them, dear reader. What I have tried and noted down though are three of the Germans. I’ll do it in chronological order. And, sorry to keep making snide jokes about the current neo-prohibitionist trends, but anyone who’s worried about my drinking can rest assured that I drank these on three separate nights (not even consecutive ones) and I even shared one of them. I could be the poster boy for the new movement if they’d like (just don’t tell them that I spend Monday night judging a cocktail competition before trailing round a couple of Leeds’ best cocktail bars sampling their wares, ok?). So yes, Germany. Famously home of the pilsner and also home of the Reinheitsgebout (aka German beer purity law) which specified that the only three ingedients allowed in beer were water, barley and hops (this was before people were smart enough to understand what yeast was and that it was, y’know, quite important to making beer. I love it that people used to call years godisgoode before they really understood what happened). 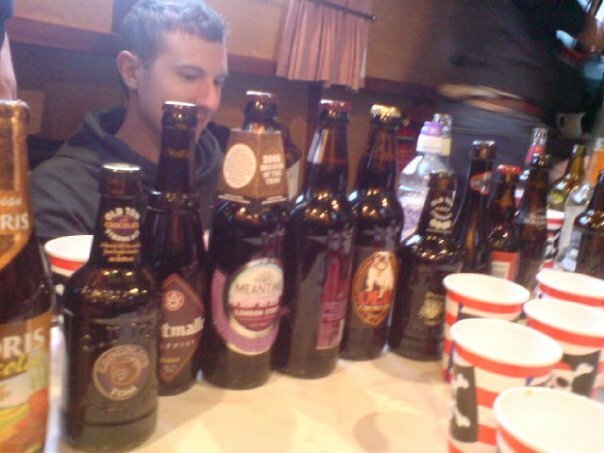 So all these beers are going to be samey, crisp, refreshing and nowt else, right? Nope. My drinking did, however, start with a very traditional lager. 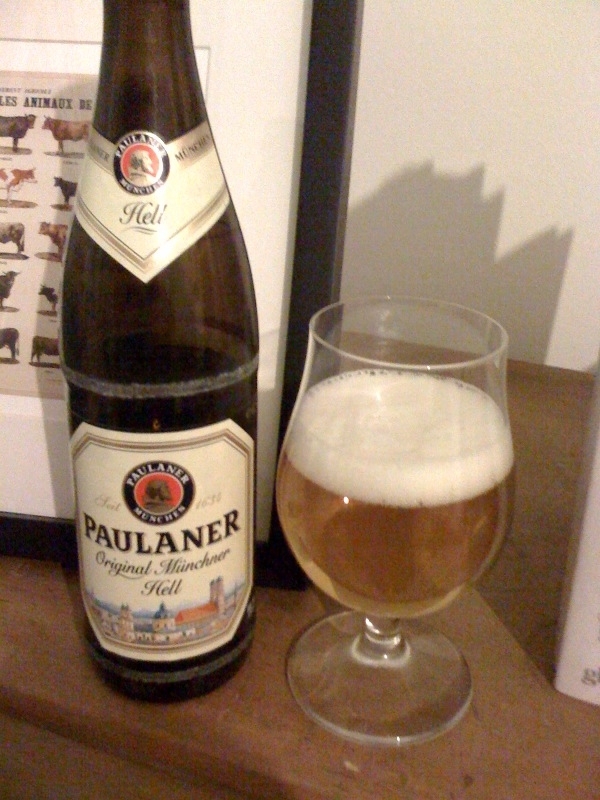 The Paulaner Original Munchen Hell. Hell was the name given to pale lagers in Germany, original means first. So therefore this is a traditional German lager. It’s bloody good, too. While it’s true that it lacks the intense flavours of most other beer styles, this is a properly light, refreshing, eminently drinkable lager. It’s straw coloured, the nose gives you citrus and honey and nice sweet things like this and to drink it’s just cool, crisp, refreshing with a little lingering hop bitterness. I’ll be having more of this in the summer, no doubt. 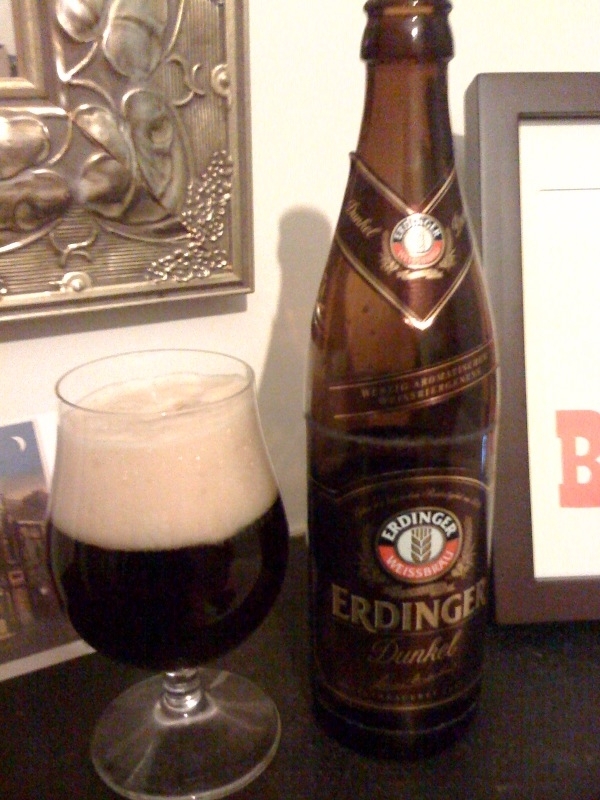 Moving on a few days later and it was a cold night and I decided to break out the Erdinger Dunkel. They used to have this on tap at North Bar permanently. Maybe they still do now, and before I really knew much about beer, this was always my drink of choice. I remember it being rich and malty and just the right bitterness. Out of this bottle, though, something was not quite right. On the nose, it smelt disarmingly like my functionable, but otherwise utterly unexceptionable first batch of homebrew. Tasting it, it was better than my homebrew, but not much better. Now, I’m not trying to big up my homebrew here, this bottle was properly disappointing. It had a slight damp cardboardy taste and smell to it, other than that, there wasn’t much there. Had something gone wrong somewhere down the line, or is this a beer for drinking on tap only? I’d be interested in someone could enlighten me. Or, maybe, my homebrew’s just awesome. Or my taste for beer has changed so much that something I once loved not tastes limp. Who knows? I seem to have accidentally saved the best for last. I’ve always enjoyed Franzikaner when I’ve bought it at a very reasonably price from Morrison’s. It was reliable, flavourful and refreshing. I’d never seen Franskinaer’s Weissbier Kristall Klar sister though. I was excited to try it. So what is Kristall Klar? 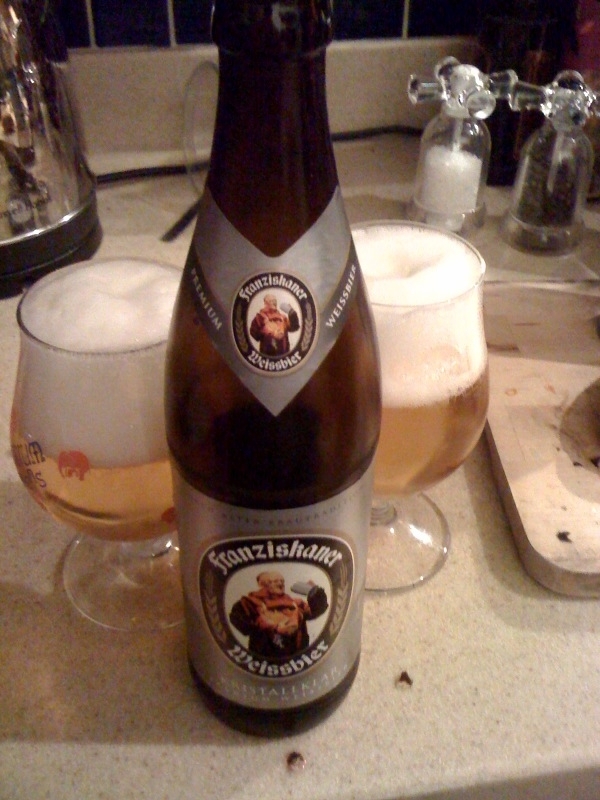 Well it seems to be the yeast-less, filtered, clear version of the original Franzikaner. It smells amazing, sweet and wheaty with hints of banana, clove, passion fruit and pineapple – loads of tropical fruit infact. Drinking it, it proves just as sweet, perhaps even lacking in bite, if you’re going to be critical. It’s not a connoseuirs beer, I’ll give you that, but it’s refreshing and just very tasty and light. Almost dessert-ish, but crisp, not sticky, and nice long lager finish. It’s not complex, but just nice. Very nice. And that’s why I like it.